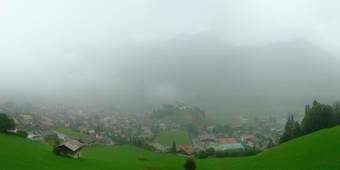 It's 13:06 in Château-d'Oex, Switzerland right now. Château-d'Oex: 360° Panorama La Braye, 0 miles away. Rougemont: Videmanette, 3.9 miles away. Les Mosses: 360° Panorama Les Mosses, 5.7 miles away. Gstaad: Many Webcams, 7.4 miles away. Gstaad: 360° Panorama Hotel Gstaad Palace, 7.4 miles away. Gstaad: roundshot 185° Panorama Huus Hotel Gstaad, 7.4 miles away. Gstaad: roundshot 210° Panorama Gstaad Airport, 7.4 miles away. Moléson: View of Mount Moléson, 7.4 miles away.